Jonathan Bepler was self-taught on many instruments by the time he attended Bennington College in Vermont. His major areas of study were composition with Louis Calabro, improvisation with Bill Dixon, percussion with Milford Graves, and performance with artists and choreographers including Lisa Nelson and Min Tanaka. His interest in collaboration and interdisciplinary work continued in New York City, where his work often involved co-mingling many seemingly disparate elements, a love of chaos, and a thirst for reconciliation. Bepler has worked with diverse choreographers including John Jasperse, Sasha Waltz, Jennifer Lacey, and Wally Cardona, and has also led ensembles of both improvised and pre-composed music, appearing often in New York and Europe. 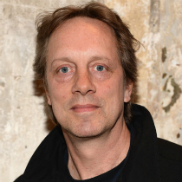 His concert music includes commissions for the Ensemble Modern, the Glenn Branca Ensemble, and the Basel Sinfonietta. His collaboration with artist Ann-Sofi Siden, featuring actors, technicians, and architecture of the Royal Dramatic Theatre of Sweden, was shown in Stockholm and Berlin. His work with Matthew Barney has spanned nearly 20 years and has included seven films and nine performances. Jonathan Bepler lives and works in Berlin. In collaboration with composer Jonathan Bepler, visionary artist Matthew Barney developed a radical reinvention of Norman Mailer’s novel Ancient Evenings. 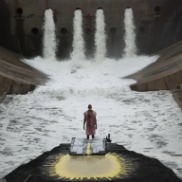 River of Fundament combines traditional modes of narrative cinema with filmed elements of performance, sculpture, and opera, reconstructing Mailer’s hypersexual story of Egyptian gods and the seven stages of reincarnation, alongside the rise and fall of the American car industry. Everything looks like something. But apparently you can’t judge a book by its cover. Despite the interplay and disjunction between essence and appearance, all artistic work uses its perceptual surface (what it looks like, sounds like, feels like, …) as a means of transmission. The aesthetics of a work of art speak to the value systems of its author(s), which are in turn formed through the construction of such eternally slippery terms as beauty. Within between is a new evening-length work by Jasperse with an original score by composer Jonathan Bepler, whose music is referred to as being "a marvel - full of mysteries, quietly chaotic" (www.artsjournal.com). Jasperse seeks both to embrace and to resist the habits of his own history, to create a cross pollination or catalytic mating of sensibilities, where the work emerges out of the space between what seems to be distinct terrains.